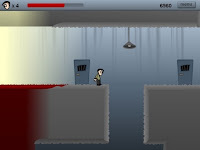 MindScape is a flash platformer, developed by Manuel Fallmann. You play inside a 'delusional state of mind' and you must try to escape, which I thought was a unique storyline and fitted in with how the game played. The world you play in literally rotates, depending on where you go, since some parts of the delusional state of mind are not facing the same way as others. At times these mechanics work quite well and other times, they become a little disorientating. The general graphical presentation and soundtrack weren't really my style either but the game itself did hold my attention for quite sometime.